Yes, 3PLs can also be your contract packagers – for smaller projects like gift pack creation and even for more complex, primary packaging solutions. 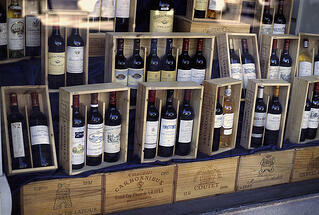 It’s one of the 10 tips in our recent blog on streamlining wine and spirits distribution. If you use outside contract packagers for secondary packaging, like gift pack assembly, here’s what often happens: (a) inventory is removed from storage and shipped to a contractor packager (Co-packer); (b) you lose visibility to that product while it is being reconfigured; (c) product is repackaged by the co-packer; and (d) product is shipped back to the distribution center (DC), where it originated. Clearly, a lot of time and costly back and forth movement could be avoided if the 3PL who operates the DC can handle this value-added product packaging work. And many can. In fact, value added services such as variety pack creation and other final packaging tasks have become a staple service for advanced 3PLs. But old habits die hard and products are still being shuttled back and forth between packagers and distribution centers, eating up time and freight dollars. Secondary packaging involves reconfiguring existing products, while primary packaging involves finalizing the product for sale through bottle filling, blister packing and other packaging methods. Primary packaging services are a stretch for many 3PLs, but some have embraced the opportunity to move upstream in the supply chain in order to give customers a leaner, simpler operation. 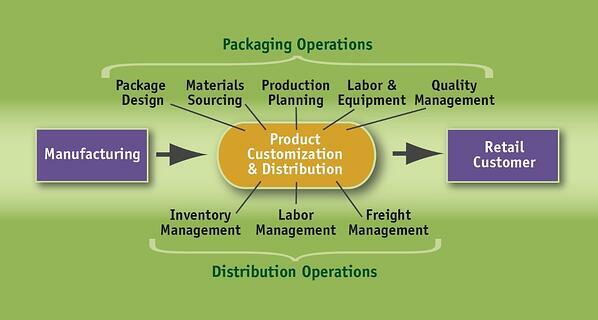 In the chart below, you see the typical delineation between packaging and distribution operations. The functions have traditionally operated in silos, but a strong economic case can be made for integrating these operations. By creating a combined “product customization and distribution operation,” wine and spirits companies, and other manufacturers, could cut weeks off cycle time and as much as 30% off the combined cost of warehousing, packaging and freight transportation. It enables a largely virtual supply chain where wine and spirits makers could focus all energy and resources on making and marketing their products. Management of the packaging and distribution would be simplified as more services are integrated with a single strategic supplier. To reduce freight costs, cycle time and carbon emissions, supply chains of the future are likely to minimize unnecessary product movements. Many 3PL providers have made substantial investments to deliver more and more of what leading manufacturers require in one place, including contract packaging services. How are you handling packaging currently? Is there an opportunity to streamline the process? It may be worth a closer look.